The bonds have handed investors a 21 percent loss since late February when the Dallas-based company reported a wider-than-expected quarterly loss and said it’s looking at alternatives that may include a sale. That’s by far the worst performance among 61 food and beverage issuers tracked by Bloomberg globally. On average, the group gained 0.9 percent. The company’s shares have done even worse in the same span, plunging 46 percent. --Kenneth Shea, North American food and beverage analyst. The company didn’t provide a comment when asked about the selloff. Dean hired Evercore Group LLC to undertake the strategic review, which has no set timetable, including consideration of standalone initiatives, selling assets or forming a joint venture. JPMorgan Chase & Co. has said it would be unlikely to find a buyer. The company had already begun consolidating manufacturing and distribution, but has struggled with its turnaround plans, Chief Executive Officer Ralph Scozzafava said in November. Per capita, Americans are drinking 40 percent less milk than they did in 1975. 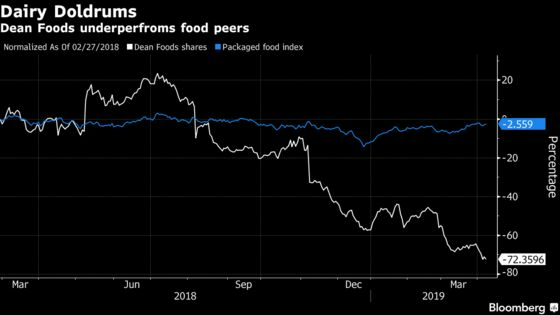 Dean is the worst-performing stock among North America packaged food producers tracked by Bloomberg in the past year, losing 72 percent. The stock began trading below its book value in November while the peer group fetches an average of 3.1 times book. The company’s notes due 2023 hit a record low 59.25 cents on the dollar this week, pushing up the yield to 23 percent. That puts it among the 100 most distressed dollar issuers tracked by Bloomberg.